As dictated by your overwhelming votes for your ultimate amethyst tiara, we're spending some time with this ex-British royal tiara today. 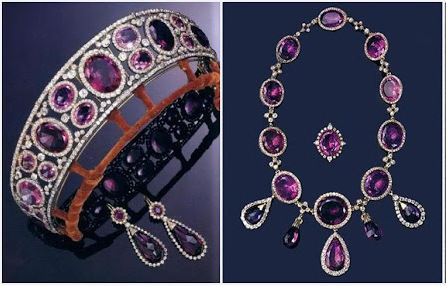 Often said to have been acquired by Queen Mary at a charity auction or raffle, this parure includes a collection of generously sized amethysts, primarily oval and framed by diamonds. The tiara includes large oval amethysts positioned vertically between sets of two horizontally stacked smaller oval amethysts. 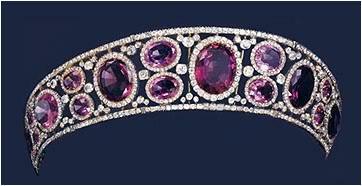 The whole diadem is studded with extra diamonds and is enclosed by a straight row of diamonds at the top and bottom. Though rounded gems of any sort surrounded by diamonds is an old concept, the set manages to take on a rather modern look. Queen Mary wore this earlier in her life. This was a time when mourning was strictly observed, especially at the royal court: black worn for lengthy periods of time - months, sometimes - followed by a period of half-mourning, during which tones like white, gray, lavender, and mauve were allowed back into the wardrobe. Jewels were expected to follow along with these guidelines, and so amethyst was a particularly useful stone (it's no wonder Queen Alexandra had several pieces, given the number of years she lived in the perpetual mourning of Queen Victoria's court). 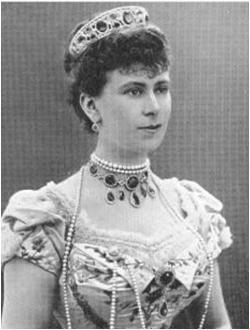 But once times changed, Queen Mary seems swift to have dispensed with her mourning jewels; several pieces of the black jewelry required for the first mourning period were given away, and this set of amethysts seems to have been retired too. The amethysts found their way to the auction block. It's commonly told that Queen Elizabeth the Queen Mother was the one behind the sale - the gossipy version here throws in the idea that the sale had to do with horse racing debts. Sometimes it is even mentioned that she first offered the set to her daughter, the current Queen. Personally, I'm not sure where this story originated, and I'm not sure I buy it. No, neither the Queen Mother nor the Queen are/were big fans of amethyst (the Queen wears purple regularly during the day, but has largely left most of her chief set of amethysts in the vault for her reign), but selling jewels - particularly to settle a gambling debt, of all things - seems out of character. Perhaps they were given to someone else to start with. Regardless, the set is gone. When sold, it included the tiara, a necklace with pendants, a pair of earrings, and a brooch. We don't know where it is today, except that Anna Wintour of Vogue fame was spotted once in what looks to be the same necklace. It's a shame, really. The Duchess of Cornwall doesn't seem to share the amethyst aversion of the Queen or Queen Mother, and I can't help but think she might have given this fresh life. Alas! Did you vote for this one? Why, or why not?